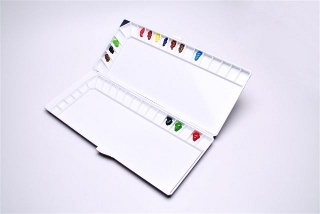 The Martin Universal Design Mijello Silver Nano Watercolor Palette 92-WP3040 is a revolutionary folding palette that is capable of being handheld with a thumb or as stationary unit. 40 Square shaped Wells that are ergonomically slanted forward to allow easier accumulation of paint. Palette is offers anti-bacterial properties so remains fresh during storage. Closed Size: 14.4" x 6" W x 1.125" H.